Photos of Janneke by Gabriëlle Barros Martins. Janneke van der Putten’s work is made possible with the support of CBK Rotterdam (Centre for Visual Arts Rotterdam). This event is organised by Thom Driver, an artist and musician based in Amsterdam. He is currently doing a fine art MA at the Sandberg Instituut, with particular emphasis on the voice, across genres and contexts. 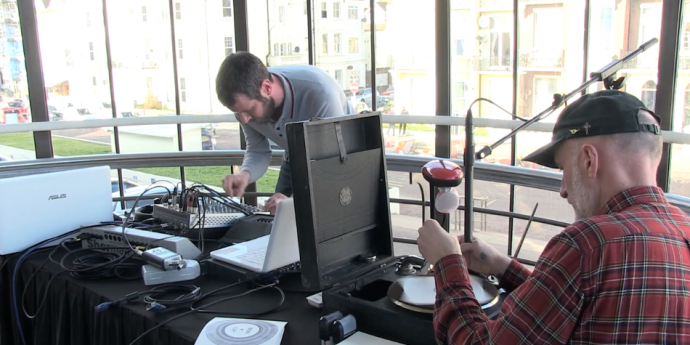 Original Copy is an ongoing project by UK-based artists John Strutton and Rick Carbone, which uses an old windup gramophone as a drawing machine. The project has taken various forms including drawing installations, video and audio works, and live performances. In the performances, sound is manipulated and mixed from microphone and camera inputs on the gramophone as the drawings are created. Original Copy focuses on the ritualistic aspect of making, like a kind of seance in which the artists attempt to give voice to information being inscribed on paper. Previous iterations of Original Copy have taken place at venues in the UK including De La Warr Pavilion, Milton Keynes Gallery and Wimbledon School of Art; and at Extrapool in Nijmegen. Sis_Mic is an electracoustic composer and she also experiments sound with improvisation or sound installations. She describes her music as a body music, because of its physical demands, both from herself and from her audience. Her music is an exploration of materials, creation and transformation of materials. She proposes sound paths that would awake this constantly passing between inside us and surrounding world. Sis_Mic also works in collaboration with choreographers (William Petit- Mathilde Monfreux) filmmaker (François Billaud) and musicians (Cati Delolme-Floy Krouchi- David Merlo) and has carried out commissions from Ensemble Télémaque and gmem-CNCM marseille She is supported by gmem-CNCM Marseille.